I received a Nature’s Bakery Strawberry Fig bar in a recent Popsugar Must Have box. Today, I decided to try it out! It’s self described as 100% natural, cholesterol free, dairy free, 0g of trans fat, kosher, and non GMO. All of the ingredients are recognizable and easily pronounced. They’re chewy and taste good. Sweet but not overly. Pretty much exactly like a cereal bar (Nutri-grain or the like) so if you enjoy those, you’d probably enjoy this. 110 calories, 2.5 g of fat, 35 mg of sodium, 20 g of carbohydrates, 10 g of sugars, and 2 g of protein. Will I buy this? No. But not because it’s not a fine specimen in the world of cereal bars. I just don’t eat grains most of the time. And when I do eat grains, I’m usually going all out and it’s going to be some sort of dessert. Nomnomnom, dessert. But I would definitely recommend this if it *is* your thing. 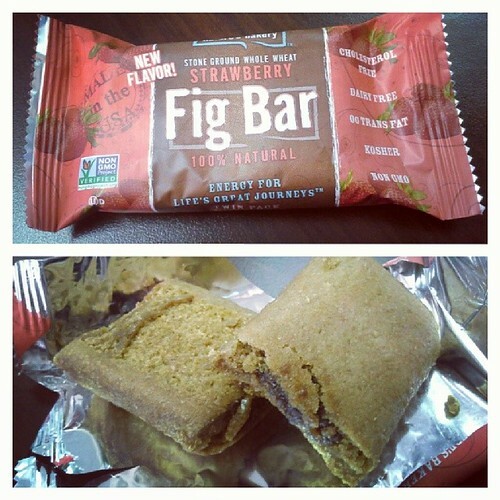 This entry was posted in food and tagged cereal bar, food, review, strawberry fig bar.